Sammie Davidson is a Mizzou cheerleader and health sciences major who plans to become an optometrist. She is also bilaterally deaf and wears a cochlear implant. While Tiger fans roar in the Memorial Stadium stands, Sammie Davidson cheers on players from the sidelines. She hears a blend of sounds — the music from the band mixed with the cheering crowd. Davidson knows the cheers well; her job is to lead them as part of the MU Cheerleaders. “I get so swept up in all the excitement that it all kind of blurs together,” says Davidson, a health sciences major from Dardenne Prairie, Missouri. On an average day, she wakes up for an 8 a.m. chemistry class before trying to get in a cardio workout mid-day. After a few other classes, she heads to cheer practice around 5 p.m. After three hours of team practice, Davidson tries to attend her church group or hang out with friends. The squad cheers for football, basketball, volleyball and requested events. Depending on the week, the cheerleaders might only get Sunday off. Davidson’s routine is relatively typical for a student-athlete, but there are a few small differences. She relies on a note-taker and an assistant who live-captions her classes via Skype. Davidson is bilaterally deaf and uses a cochlear implant. The accommodations from the MU Disability Center have helped remove barriers that would otherwise prevent her from performing at her best. Davidson recently received the U.S. Bank scholarship through the Disability Center, which relieved some of her financial burden. “It was super awesome to be recognized and know that my hard work paid off,” she says. Davidson chose to major in health sciences because she has always wanted to be an optometrist. Oddly enough, it’s a decision influenced by her deafness. “Since I can’t hear, I might as well help people see,” she says. She hopes to be a medical missionary overseas someday. Davidson is thankful to have coaches, teammates and friends who support her. While cheering, her teammates make sure she doesn’t miss any of the beats in practice or during the cacophony of noise on game days. Her friends outside the squad have her back, too. “[They] make sure that they’re really inclusive and that I’m part of the conversation, too,” she says. 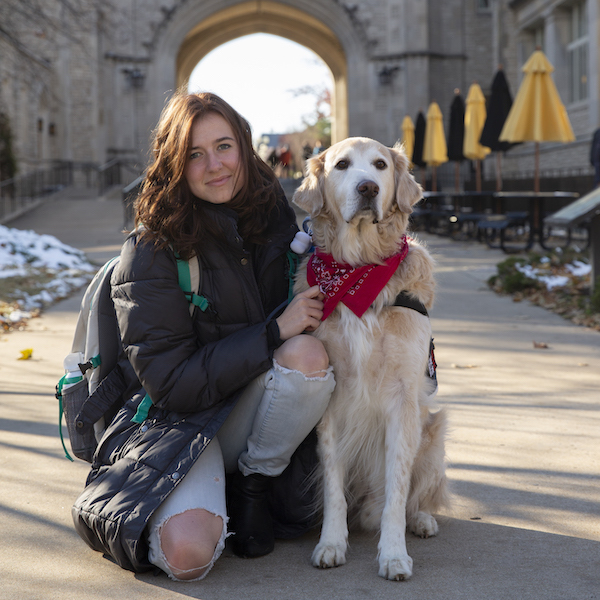 Mizzou students talk about navigating college with a non-apparent disability. As assistant director of the Disability Center, Ashley Brickley helps ensure all students have equal opportunity to maximize their education at Mizzou.